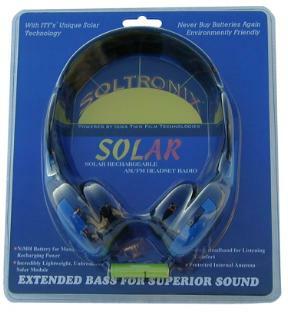 The HR-1 is a solar rechargeable AM/FM stereo headset radio with superb sound. The solar module allows it to operate on as little 30% of full sunlight. Excess power generated goes to recharging the NiMH internal battery while the headphones are still operating. When the radio is off, all power goes to charging the battery. One hour of charging in bright sunlight give 1 to 2 hours of playtime, and a fully charged battery provides over 18 hours of playtime. Great for hands-free operation while on the move: jogging, walking, hiking, gardening, etc.